Tai chi, also called tai chi chuan, was developed as a martial art in 13th-century China. It blends flowing movements and relaxation with deep breathing, and it's practiced worldwide as a health-promoting form of physical activity. The practice has proven health benefits, such as stress reduction, improved posture, balance, increased muscle strength in the legs and general mobility. Tai chi is suitable for people of all ages and can even be practiced by those with a disability, including wheelchair users. There are several different types of tai chi, depending on the way the body holds the postures and the speed of the movement. For the most part, the movements are quite gentle and many are done in a position similar to a squat. If you're hoping to start practicing the martial art, you can watch a class or take a free session before signing up for a full course. There are a number of warmup exercises you can do before beginning your practice. 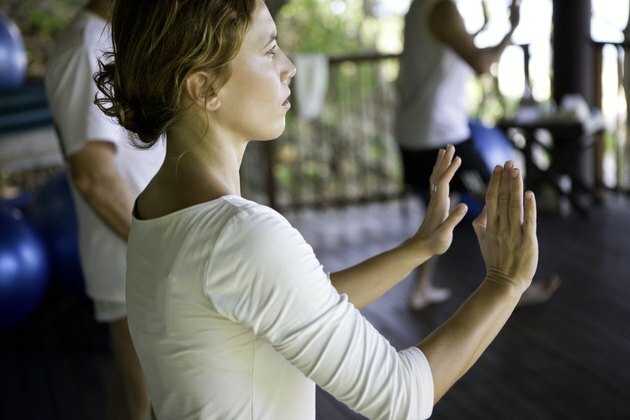 Warming up can get your focus, intent and breathing on track before you get into your basic tai chi moves. Warmups include head rolls, in which you gently circle your head in one direction, then the other while breathing deeply; the simple stretch, when you bend down to your toes and slowly come back up with your hands on your hips; shoulder rolls; arm circles with your arms stretched out to the sides; picking fruit, in which you stand with your legs shoulder-width apart and reach upward; knee circles; and hip rolls. This move is one of the tai chi basics. Put your feet together and relax your hands at your sides. Take a breath in while bending your knees and sinking down, left hand flat and right hand balled up in a fist. Continuing to inhale, cover your right fist with your left hand and lift up. Come to a straight-legged stance. Exhale, release and sink back down. Begin this move in a t-stance. Lift one hand up, palm pacing front. The opposite hand is in front of the body, palm facing downward. As you bring one foot forward, twist your body at the waist and push your raised hand forward, while putting the opposite hand down. To finish, circle your arms back to starting position. Exhale on the push with the top hand and inhale on the circle back. Bring both hands in one on top of the other with a space in the middle, palms facing each other, as if you're carrying a ball. Shift your weight to whichever foot is on the same side as the top hand. So if your right hand is on top, shift your weight to your right foot. Bring the opposite leg in front and as you shift your weight to the front leg, move the bottom hand forward as if you're throwing a Frisbee. The other hand should come back and down to "rest on a large dog's head."